This pipe stop and holder is of heavy duty construction for use in schools, institutions etc. All stainless steel components with rubber buffer. Floor portion is solid 25mm diameter x 280mm long stainless steel rod which is secured in cement. The rubber bumper plate is fixed to the door and hits the floor mounted pipe when used to stop. 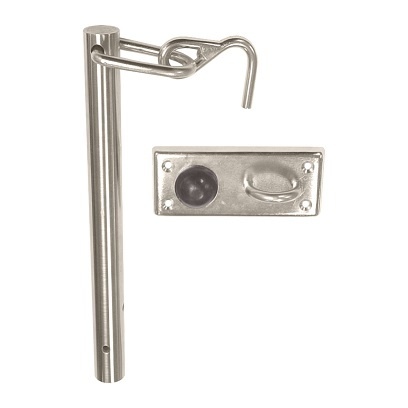 The door is hooked to the floor portion with stainless steel hook when used as a holder. The door hook rotates out of the way when not in use.